City Guide Things to do in Barcelona What to do in Barcelona in 1, 2, 3 or 4 days? To our friends who come to see us we often give the same advice: a 3-day visit to Barcelona is a good introduction to this city, a stay sufficient to capture the ambience and serenely discover its main monuments and places of interest. Our entire website is dedicated to discovering this city with its guide, where to eat, night life, shopping, monuments, museums and ticket and tours. This page is a kind of summary where we propose you routes per day, advices and tips how not to spend too much. It will help you to make the most of your trip. What to do in Barcelona in 1 Day ? One day in Barcelona? So you're in "combat mode", get up early and let's go. From our point of view, it is necessary to mix exploring the city by foot, bicycle or tourist bus and at least the visit of a monument or museum. The focus will therefore be on the historic districts of Barcelona, in the so-called Ciutat Vella - the old city and those districts like El Born, El Gótico and Barceloneta. We will choose at random a monument of Gaudi or a museum before taking time to eat some tapas or enjoy the Catalan cuisine. Find all itineraries in Barcelona below in this page. What to do in Barcelona in 2 days? The second day of a visit to Barcelona is devoted to the discovery of Modernism. It is a great day that will combine bus rides with the exploration of the city's main modernist monuments: Casa Milà – the Pedrera, Casa Amatller, Casa Batlló, Casa Calvet, Casa de les Punxes, the Guell Park, the Sagrada Familia and other admirable monuments, many of which are the work of Gaudi. We reassure you that it is not cheesy to take the tourist bus, it is even the best way to go from one point to another in complete freedom. Use it once to discover a city and your opinion will change if you need to. What to do in Barcelona in 3 days? For the third day of your visit, we propose an itinerary that will allow you to discover more precisely the richness of the western part of the city: In the Plaza d'España, the Pavilion Mies Van de Rohe, the Poble Espanyol, the Mnac, the Joan Miró Foundation, Montjuïc, the port and the Olympic port, the Museum of History of Catalonia, the Gothic Quarter and why not if you haven't had time yet for the Picasso Museum. Culture and entertainment are on the agenda! What to do in Barcelona in 4 days? You are not satisfied with Barcelona, but you want to make a day of “farniente”. Visits are rewarding but often exhausting. In this case, there is only one solution: a short bike ride or a walk by the sea. Go to the beach, enjoy little chiringuitos and their dj's. It is therefore by discovering the fishermen's quarter - Barceloneta - that your walk will begin. As you are used to traveling, you have certainly booked your hotel in the centre of Barcelona. So you are already at the heart of the matter. If you have not had this chance, it is not a problem, the means of transport are numerous and much more economical than in other European capitals. Jump on a bus in the direction of Plaza Catalunya (Square of Catalonia) around which the whole historic city radiates. As you only have one day we will be quite directive but with some options and variants. When you turn back to the Cortes Inglés, this department store which occupies a whole corner of the Plaza de Catalunya - impossible not to see it - cross diagonally the plaza and head towards the Ramblas - this avenue which goes towards the port and the sea. The Rambla is picturesque, continuously animated by numerous kiosks and its sellers of newspapers, flowers and souvenirs. The opportunity to visit the Boqueria Market before diving on your left towards the Gothic quarter. The Barrio Gotico is the medieval centre of the city, a real labyrinth! Around the Cathedral, get lost in the alleys. This is where the most important historical events in Barcelona's history were played out. This district has developed around the Roman city of Barcelona called "Barcino" from which some Roman remains can still be seen. At random you will come across the Basilica of Santa Maria del Pi, Plaça del Rei, Plaça Nova, Plaça de Sant Jaume. It's time to take a lunch break. Find here the restaurants of the Ciutat Vella. The other part of the day should be devoted to visiting a museum or monument regardless of its location in the city. Of course we think of one of the monuments of Antoni Gaudí. How can anyone imagine leaving this city without discovering at least one of the masterpieces of the brilliant Catalan architect? Impossible. Again, we are a little prescriptive but it is undoubtedly La Sagrada Familia that you should visit. Wherever you are, find a way to get there. 15 minutes by bus from Plaza de Catalunya or half an hour by walking. However, here are several other options that may allow you to finish this day of discovery of Barcelona. This special offer combines a visit to the Sagrada Familia with a skip the line ticket and Hop on Hop off Bus ticket. You stop where you want and then you take the tour of the city to see its main monuments. Same principle with this other combined ticket which proposes: The visit, without making a waiting line of the Picasso Museum and the tour of Barcelona by Hop on Hop off Bus. From Barrio Gotico you are just a stone's throw from the Picasso Museum. Finish your morning with the Master and take advantage of the afternoon to take this tourist bus with audio guide in english. Finally, another ideal solution for this itinerary day one is the visit of Casa Mila of Gaudi, the famous Pedrera and always the discovery of Barcelona by bus HOP-ON HOP-OFF. Our tip: Don't hesitate to choose these combined tickets that save you money for your visits and save time at the entrance. Barcelona is a very popular city, our only tip is to use as much as possible these discounted tickets; an innovative and highly successful concept. Warning: Buying skip the line ticket requires you to plan your visit – to choose the time of the visit- , unlike the bus ticket which is open all day long from 9:00 to 19:00 in winter and 20:00 in summer. 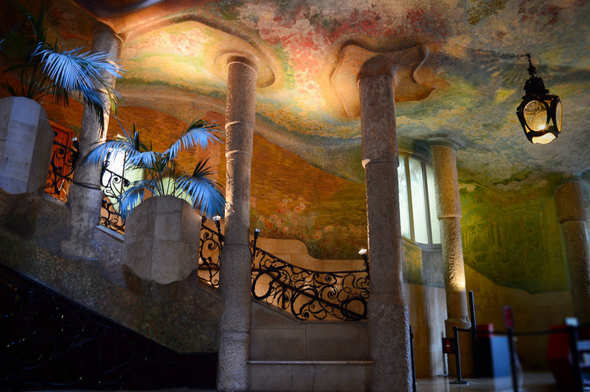 Your second day in Barcelona will be devoted to the discovery of Modernism. This is an incredible day for you, during which you will go back in time to explore this wonderful era of Barcelona where wealthy entrepreneurs were financing the best architects of the moment to have the most beautiful homes in the city. To make this as simple as possible, we recommend the Hop on Hop off Bus. It may seem a little outdated but it's a great way to get around listening audio guides in English. A total of three bus lines offer 45 possible stops. For modernism, however, we recommend the blue route. The blue route will take you to the most important places of Modernism such as Casa Batlló, Casa Milà - la Pedrera, Casa Amatller, Casa Calvet, Sagrada Familia, Güell Park, Tibidabo, Camp Nou, Barcelona Stadium and finally the Macba. The red route will take you to: the Tapiès Foundation, Casa Batlló, Casa Milà - la Pedrera, Casa Amatller but also the Spanish square, the Mies Van de Rohe Pavilion, the Poble Espanyol, the Mnac, the Joan Miro Foundation, the port and the Olympic port and the Gothic quarter. The green route takes you along the seaside along the Ronda Littoral. It's up to you to make the stopover that suits you best. Here's the map of the 3 routes. The highlights of your day, are for us: Casa Batlló, Casa Milà - Pedrera, Sagrada Familia, Park Guell and the FC Barcelona stadium. Barcelona.com City Pass - This is the best bargain of the moment to visit Barcelona and it counts! It includes visits to the Sagrada Familia, to the Guell Park but also the tourist bus for one or two days, your ticket to and from the city centre to the airport and 20% off for many other monuments and museums of the city. Think about your visit dates and hours before you leave because it will be requested. We have done the arithmetic for you, these combined tickets are very economical in a city that is very expensive to visit. In addition, they guarantee you an entry without losing time, which is recommended all year round. As you can see, the second day was devoted to the discovery of Modernism, the third day will be dedicated to the western part of the city and the port. An itinerary that will make you explore: the Tapiès Foundation, Casa Batlló, Casa Milà - la Pedrera, Casa Amatller, but also the Plaza España, the Mies Van de Rohe Pavilion, the Poble Espanyol, the Mnac, the Joan Miró Foundation, Montjuïc, the port and the Olympic harbour, the Museum of the History of Catalonia, and the Gothic Quarter where you can reach the Picasso Museum. We therefore recommend the red route of the bus with multiple stops. Stop where your heart tells you and according to your preferences. Our advice is not to miss the Mies Van de Rohe Pavilion, the Mnac, the Joan Miró Foundation and if you are with children the Poble Espanyol and all its attractions. "Farniente" in the agenda of this day without visit but just humming the particular ambiance of the city. In this city anyone who works takes an hour a day to have lunch or a drink by the sea. It is the obligatory break for every Catalan who never forgets that his marvellous city is a maritime city. 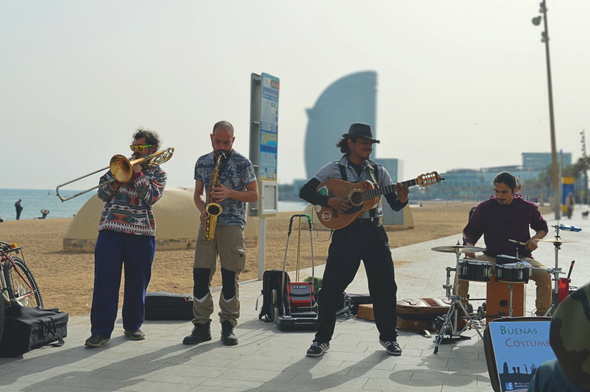 You will do the same, starting with a visit to the Barceloneta district. It was the very popular district of the fishermen. Good restaurants are do not miss like the shops specialized in beach articles. We invite you to visit our selection of the best chiringuitos in this area. An don't forget, he purpose of the day will be to relax at the beach. As for organized tours, it's a very nice thing to do is to rent a scooter, a bicycle or a segway to roam freely without any specific objective, just following the seaside. I dream of staying at least a week but this time it will be 3 days..